❤Top 10 Hot Women Straw Clutch Handbag: Best choice for fashionista. 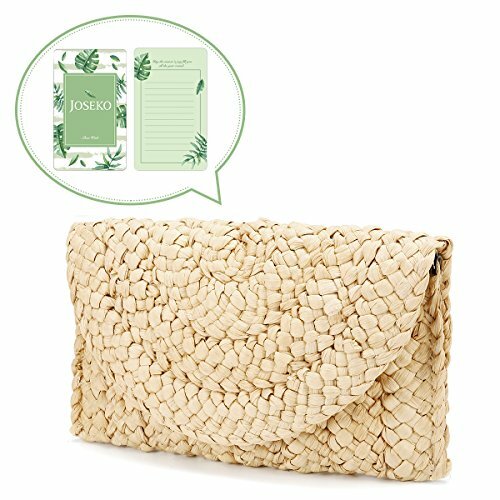 100% natural straw & corn peel bag, exquisite straw surface, magnetic closure, durable, long usage time, unique and chic. ❤Special Design: Perfect as a handbag or wallet purse. This unique women clutch bag makes you look fashionable. Perfect for any occasion: beach, party, shopping, camping, and dating, it shows your special personal character. ❤Dimensions: 7.48''x 1.18''x 4.33''(L x W x H); Closure: Hasp; It can hold your wallet, cell phone, keys, cosmetics and so on. ❤Ideal Gift: Wonderful gift for your lover, family, and friends. ❤Sale Support: Our product has strict quality inspection.If there is any quality problem when you get it, please kindly contact us,we will be glad to help you solve the problem.Your satisfaction and love is our best encouragement. Any questions on our customer services,welcome to suggest,thanks!